"People can be so brilliant. Thank you, whoever did it," says the tweet. The little stories that detail random acts of kindness always make the Internet happy - especially the ones in which people do something nice for a stranger without expecting something in return. That's probably why this tweet posted by a writer from Germany has received so much love from people on Twitter. The tweet details how a little sticker pasted by some kind strangers made this family's day. Since being tweeted on September 24, the tweet has collected over 2.4 lakh 'likes' and more than 54,000 retweets - and still counting. 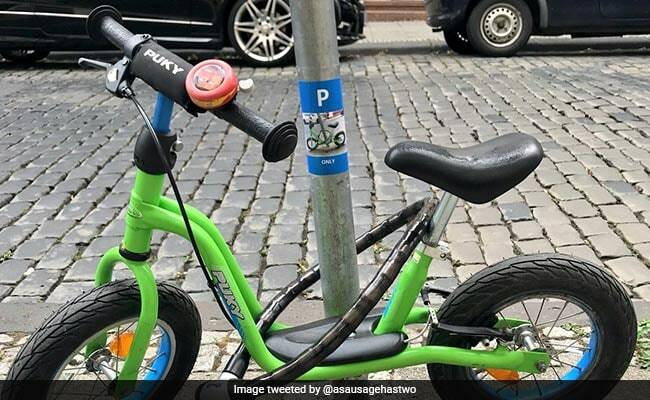 In her tweet, Christie Dietz explains how her son would park his bicycle by a particular lamppost nearly every day for the past year. The family got a nice surprise when one day they noticed a sticker pasted on the lamppost. The tweet is accompanied by a picture of said sticker. The sticker shows a picture of the child's bike parked by the lamppost and claims the spot is reserved for this particular bike only. "We were really touched by someone carrying out such a sweet and joyful idea," Ms Dietz told the BBC. "My son is very happy about the sticker." The tweet has received a ton of wonderful comments from people just as happy to see the random act of kindness. "OMG they must've had SO much fun doing that! So much that they didn't want credit, it was its own reward!" says one Twitter user. "The fact the sticker is right at your son's height as well. Lovely. Little things like this give me hope for humanity," says another. "OK, that's the most adorable random act of kindness ever," says one comment. "I absolutely love this story! Thanks for sharing and putting a smile on the face of strangers," says another.